(MoneyWatch) It's a dangerous world we live in. There was a time when the worst thing that could happen if you got your wallet stolen was to lose the cash you had on hand. These days, your wallet is a gateway to identity theft, which can quite literally ruin your entire life for months or even years afterwards. It pays to take all the reasonable precautions you can against identity theft. Don't keep your Social Security card on your person. There was a time when it made sense to carry your social security card in your wallet or purse, but those days ended in the 70s. Memorize your SSAN and lock the card up at home. Don't make it that easy for thieves who lift your wallet. Don't use your Social Security number unless you have to. There are still businesses that identify you by your Social security number. This is a really dangerous practice, since it spreads your number around in places where it is easier to steal. If you find that a bank is using your social -- even just the last four digits -- to identify your account, ask them to stop. If they don't (or can't), close the account and take your business elsewhere. Don't share personal information with anyone on the phone. Especially "cold calls." If someone claiming to be from your bank calls and says they need details like your Social Security number, address or mother's maiden name, you might be getting scammed. There are few -- very few -- scenarios in which you'd ever have to give that info up over the phone. Don't reply to unsolicited email. Spam isn't just harmless trash, and replying to it -- trying to buy something or trying a "free" offer -- can get you phished faster than you can publish your bank account number on the Internet. Use a unique password on every single site and service you use. This should be common sense by now: If you use the same password on multiple sites, your security can be compromised if any one of those sites gets hacked. Get a password keeper like Roboform or Lastpass to manage all those passwords. Don't have new checks delivered to your home. Have boxes of checks delivered to your local bank, and go there to pick them up yourself. That way, they can't be intercepted en route or stolen from your mailbox. Get a locking mailbox. With all the attention on email and cybercrime, it's easy to forget that sometimes the easiest way to be compromised is via snail mail. If your mail is delivered to a mailbox that's not directly in front of your home, consider switching to a locking mailbox so random passersby can't rummage through it. Shred your mail. Don't just throw away old bank statements and credit card offers that come partially filled out. Invest in a cheap shredder and turn all the mail you get that has personally identifiable information into thin strips of gibberish. Otherwise, your identity is stolen as easily as someone rooting through your trash. 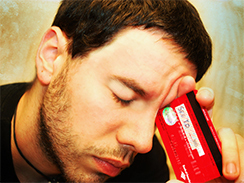 Review your credit card statements. These days, you probably get a digital statement. Unfortunately, out of sight is out of mind, and you might rarely actually review all the charges on your cards. That's dangerous, though -- you'll want to discover as quickly as possible if someone is making unauthorized charges on your cards. Maintain an emergency contact list. If the worst happens and you believe that your identity has been stolen, time is of the essence. Have a list of phone numbers for all of your financial institutions so you can follow up with them quickly and efficiently.